PRINT: Come see why PRINT has been named one of the top newcomers in Manhattan in 2011 at any of three Thanksgiving seatings (1pm, 4pm, and 7pm). The traditional Thanksgiving menu sources its ingredients from local farms and regional vendors and includes Heather’s Heritage roast turkey from Windy Hollow Farm in Pennsylvania, roast baby Brussels sprouts, sausage cornbread stuffing, cranberry chestnut relish, rutabaga mash, braising greens, pumpkin pie, and pecan pie. The menu is $70 per person and $45 for children under 12. The David Rockwell design is equally enthralling. Carmine's: As if Carmine’s in Times Square and on the Upper West Side didn't give diners enough of a feast year round with their gigantic portions, the restaurants will prepare a Thanksgiving banquet to satisfy 8-10 hungry diners for $195. The family style feast includes one 18-pound roasted turkey with giblet gravy, sausage and sage stuffing, Brussels sprouts with caramelized onions and applewood smoked bacon; sautéed string beans with julienned red peppers and toasted hazelnuts; baby carrots with fresh dill; sweet potatoes topped with marshmallows and maple syrup; mashed potatoes with homemade cranberry sauce; and pumpkin, apple, or pecan pie. Virgil’s: Throw on your cowboy boots and head to Memphis (or more like Times Square) for the ultimate Southern style Thanksgiving feast for 8-10 people. Priced at $195, the mega-meal includes crawfish and duck gumbo or beef barley soup; cucumber, cabbage, and carrot salad with cilantro and red onion; one 18-pound smoked turkey with giblet gravy; cornbread, sausage, and pecan stuffing; sweet potatoes topped with marshmallows; homemade cranberry sauce; spinach and gruyere pie; Creole green beans; buttermilk biscuits; and pie. Individual orders can also be placed for $26.95 per person. The Lambs Club: Theater lovers have been buzzing about this newbie, The Lambs Club in the iconic Stanford White-designed building, a New York City Landmarks and Preservation Commission designated landmark. Look out for famous Lambs (members of America’s first professional theater club) and other notables as you enjoy the three-course menu for $65 per person, offered from 12pm-8pm. Appetizers include chestnut velouté, heirloom beet salad, Hudson Valley foie gras terrine, Lambs Club salad, and butternut squash ravioli. Entrees include roasted Amish turkey, prime Delmonico, Chatham cod, and heritage pork chop. 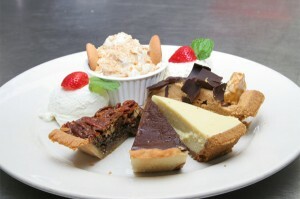 Indulge in any of the three dessert options: pumpkin ginger cheesecake, bourbon pecan pie, or cranberry pear strudel. Asiate: Ride to the 35th floor of the Mandarin Oriental Hotel where Chef de Cuisine Brandon Kida presents a perfect menu to complement the perfect views of Central Park. 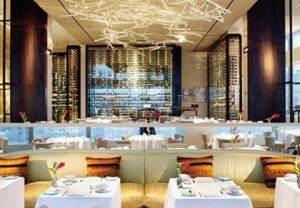 The menu will be served from 12pm-8pm for $98 per person. Start with a fall salad before moving on to the Kabocha squash risotto. 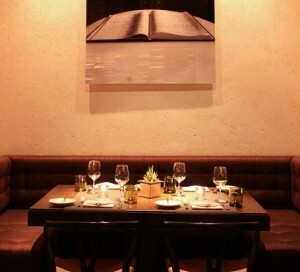 Entrée choices include Wagyu beef tenderloin, butter poached lobster, and free range turkey. The Autumn dessert duo includes blueberry and apple crumb cake or pecan pie and pumpkin cream. Fatty Crab: The Malaysian UWS sister to the downtown location is offering a Thanksgiving Industry Dinner for $55 from 4pm-10pm. Pre-buffet, enjoy passed hors d’oeuvres with a Southeast Asian flair including local oysters, tea sandwiches, or pork fries. The highlight of the buffet dinner is the “Fatty ‘Cue” smoked turkey with roasted sweet potato, red chili butter, maple syrup stuffing, cutting celery, onion, red curry turnips, gravy, and cranberry sauce. The “First Prize” pumpkin pie will leave all diners feeling like a winner. This entry was posted on Monday, November 22nd, 2010 at 1:16 am	and is filed under Stuff to Do. You can follow any responses to this entry through the RSS 2.0 feed. You can leave a response, or trackback from your own site.